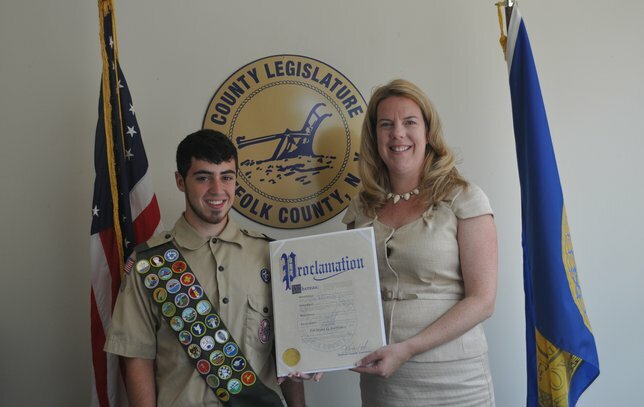 Suffolk County Legislator Kara Hahn honored Zachary G. Randall of Boy Scout Troop 377 on achieving the rank of Eagle Scout. Setauket, NY – Suffolk County Legislator Kara Hahn honored Zachary G. Randall of Boy Scout Troop 377 on achieving the rank of Eagle Scout. Zachary’s Court of Honor ceremony was held this weekend at the Bates House in Setauket. For his community service project, Zachary constructed a Literacy Center, complete with a selection of donated books, inside of the pediatric area of the Elsie Owens Health Center in Coram. Subject: LongIsland.com - Your Name sent you Article details of "Legislator Hahn Honors Troop 377’s Newest Eagle"